Mandil is a Bosmer agent, and a member of the Thieves Guild. She lives in the Imperial City's Elven Gardens District with Othrelos. Mandil is an advanced trainer in Security. She claims that it is just a hobby, but since she is a member of the Thieves Guild, the validity of that statement is questionable. Mandil wears a set of middle class clothing: a brown shirt, light brown linens and a pair of doeskin shoes. She is armed with an iron dagger and she carries her house key and a small amount of gold. The Market District, 1pm to 6pm every day except Sundas. The Arboretum district, 12pm to 6pm every Sundas. The Count's Arms in Anvil, which she visits on the 5th and 6th day of each month. She offers training in all of these locations. 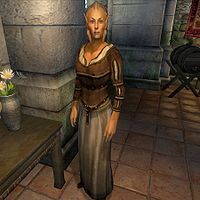 Despite her affiliation with the Thieves Guild, Mandil claims that her skills are just a hobby when she greets you: "I'm Mandil. I'm a lady of leisure, but I do some Advanced Training in Security. Just a hobby, of course." When asked about the Imperial City, she will elaborate on her hobby: "It pays to know about locks and lockpicks. It's just a hobby, of course, but the average citizen feels more secure when he understands his own locks." As an advanced trainer of Security, she will point you toward the master trainer, J'baana. Asking her about "Training" when your Security skill has reached 70 will have her tell you: "Only one has a better mastery of locks than I. You need to speak to J'baana. You can find him imprisoned at the Imperial Legion headquarters." If you ask her again about training, she will provide you with a brief reminder of what she already stated: "You must find J'baana, and learn from him." The citizens of the Imperial City can often be heard talking about Mandil's "hobby", commenting: "I understand Mandil has some rather nimble fingers." and "Lose the key to your house? Find Mandil. He can get in, I'll bet." Others can be heard asking: "Do you know Mandil? I hear he's good with locks." and "Is it true that Mandil can open almost any lock?" Citizens will reply to these comments and questions by elaborating on her abilities and mentioning that she offers training, while also incorrectly referring to her as male (see bugs): "I've heard he's good with a lockpick. ", "Rumor has it that he'll teach others to pick locks. ", "I understand he'll teach others to pick locks. If everyone knew how, we wouldn't have to carry around so many keys." and "I'm glad he's willing to teach others. Lockpicking has gotten so much harder recently. It's more interesting, but it's harder." She was going to be a part of an unfinished Black Horse Courier quest, but it was removed from the game prior to release. When asked about rumors, some citizens seem to be under the impression that Mandil is male based on the rumors they have about her. Esta página foi modificada pela última vez à(s) 17h23min de 8 de junho de 2014.